The Difference Between Soft & Hard Wax? Soft Wax — This is very liquidy and is applied to the skin in a thin layer. A muslin clothe is placed over the wax, rubbed down to fully adhere the wax to the cloth, and then once it starts to harden you pull the clothe away, bringing the wax — and hair — with it. You can’t go over the same area twice, as it removes layers of dead skin and repeating on the same section will results in more skin damage and possibly bruising. This type of wax is best used for large sections of the body, tougher areas, and if you have particularly fine hair — your thighs/legs, for example. Also, this method of waxing is most commonly more painful. Hard Wax — It gets it’s name from the fact that it does not require a clothe strip to be placed over it to remove it, you simply let it dry and it’s thick and firm enough for you to grab an edge and pull it off. This wax is a lot thicker than soft wax and when it cools it adheres — or ‘shrink wraps’ — around the strands of hair (as opposed to sticking to your skin). It still strips away a layer of skin, but is comparable to using an exfoliate. This wax is ideal for sensitive areas of the body that has coarse hair — bikini lines, Brazilians — but can be used anywhere and on any type of hair. Which is what I do. Also, if you don’t have a high pain tolerance, this is the wax to go with. While ripping your hair out in one big chunk can’t be painless, using hard wax greatly reduces the amount of pain you feel. I know this is kind of TMI — but, hey, we’re talking about waxing here! — I use this wax for my bikini area and while there is some level of pain the moment the hair is pulled out, it goes away instantly and there is no lingering pain afterwards — which I always experienced with soft wax. You want to make sure the area is cleansed before you start ripping out the hair. This will help prevent any bacteria or ‘junk’ that is on your skin from getting into the freshly-opened areas on your skin and starting an infection. 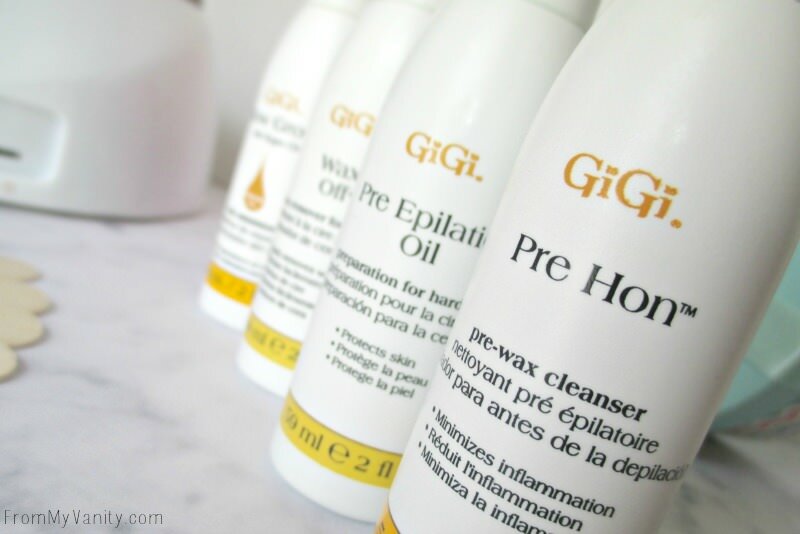 Here I’m using GiGi Pre Honey Pre-Epilation Cleanser. The next step is to either apply some oil or baby powder to your skin to create a barrier. If you have really dry skin, apply just a little to prevent the wax from aggravating the dry skin and making it worse. If you have oily or sweaty skin, use baby powder to help soak up some of that extra moisturize, as it can prevent the wax from fully adhering to the hairs. So depending, I use either the GiGi Pre-Epilation Oil or the GiGi Pre-Epilation Dusting Powder. Using these wooden applicator take a gumball size amount out and twirl it to keep the wax from dripping. Then apply it to your hair, following the natural direction your hair lays. This gives you the best results when you go to remove the strip. When you are gliding it on, make sure you make it a decently thick layer. Too thin and it will just crack and break into a million pieces when you try to remove it! Also make sure you leave a thicker piece at the end so you can easily create a ‘lip’ — as pictured above — and remove the wax strip. If you can’t get a lip, you’ll have to slowly pick at the wax until you bring enough up to create that lip…and that’s not a pleasant feeling to slowly be pulling at a few hairs at a time. Once the wax has cooled and is firm to the touch, grab the lip and pull in the opposite direction of hair growth. Do this in one quick motion, if possible, to lessen the pain. Also make sure you keep your hair close to your skin as you pull it — you never want to yank the strip straight up as this intensifies the pain and can bruise or damage to your skin. Once you’ve finished waxing off all the hair you will no doubt have random patches of wax that didn’t come off. When you first start off, there will be a lot of these patches, but as you continue to practice and get better at it, you won’t have as many. I used the GiGi Wax Off Wax Remover, but I am in the market for a better one. This one requires too much ‘scrubbing’ to get it all off. After all that hard work, I recommend using a lotion that helps to slow the growth of the hair. It can take a long time to wax (especially if you do your legs or a Brazilian!) and I want my skin to remain hairless for as long as possible! I’ve been using GiGi Slow Grow Hair Minimizer and when I remember to use it daily (that is the key!) I do notice that the hair takes a bit longer to grow back in. EDIT MADE MAY 20, 2018: I get a lot of questions on what I use to prevent ingrown hair. I definitely recommend you use something daily — I’ve been using this one from GiGi and it works pretty well for me. Now tell me, do you wax? In a salon or at home? I really hope this tutorial was helpful for you! If you have any other questions, or would like to see how to use soft wax, or sugar wax…anything! Just let me know in a comment below! I purchased all products on my own. I was not compensated for writing this post. Links used are affiliate links. All thoughts are 100% my own. Any questions about my disclosure, read here. Thank you for your support! I’ve never liked waxing but I think its because I always used soft wax. I didn’t know the difference, so thanks for explaining! I think I would like to try hard wax before writing it off all together. Glad you found it helpful! I love hard wax because it’s also less messy than hard wax! Hey! I have never waxed before, out of fear, but your article has convinced me that it can be easy peasy and less painful. I am gonna give it a try. I hope it goes well for you! No wax is painless, just remember that, but once you get the knack of how to apply the hard wax, it isn’t so bad. 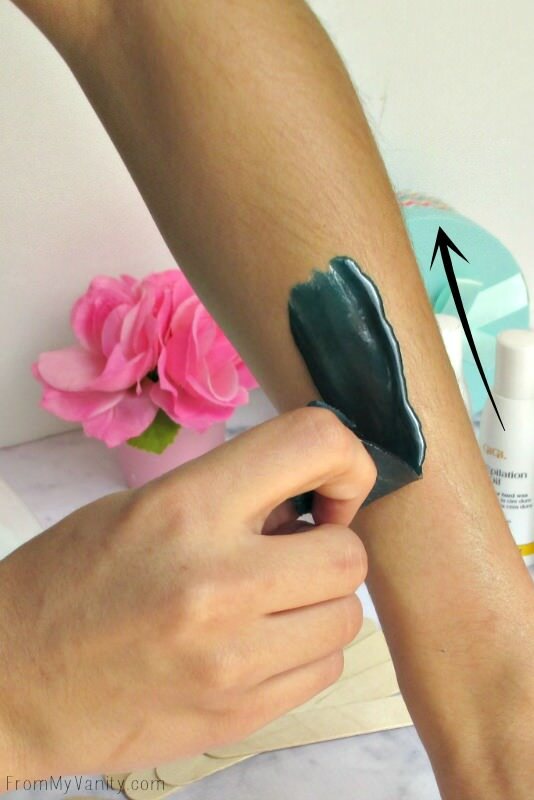 🙂 Waxing your arm is a great place to start and get the hang of it, in my opinion, because it’s not as sensitive as your lips, thighs, or bikini area. 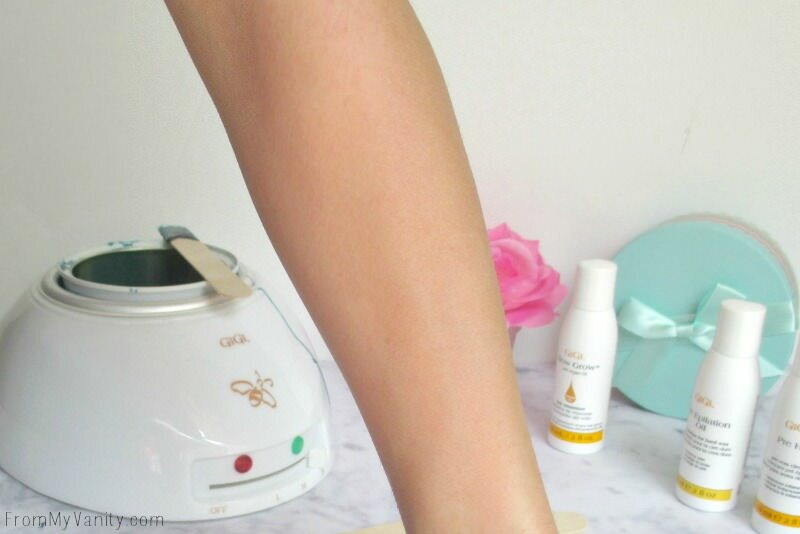 When waxing your legs how long would you say it lasts before you have to wax again? I’m weird – I can’t deal with hard wax. I always ask for soft wax and I can’t do honey mixtures either for some reason… I’m not allergic but it just doesn’t work well with my skin. I go to a salon though just because I don’t want to mess with well, the mess! 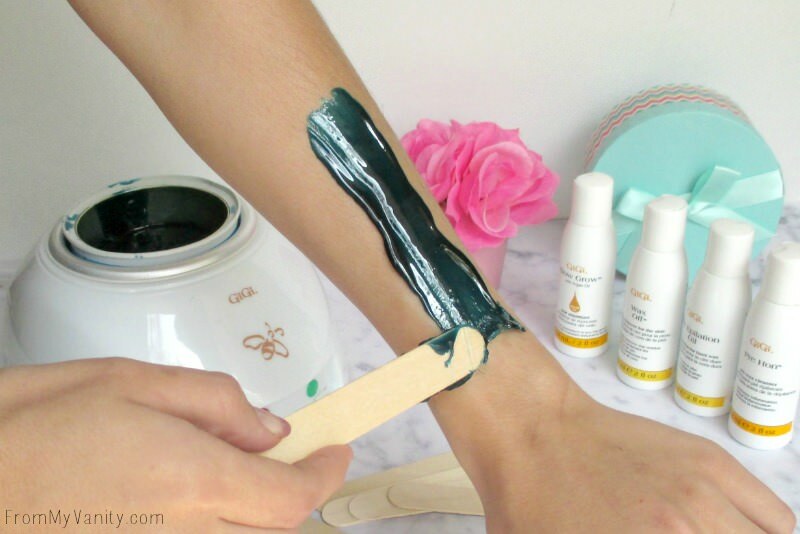 Love this post though – great to show that you can DIY this beauty treatment at home! Wow!!! I never knew there were different types of waxes!! I would love to try out some hard wax. The type of wax that you use makes all of the difference! I prefer hard wax so much!!! This post just reminded me that I really need to wax my arms, ha!!! I’m going to have to check out the wax that you suggested because I had been using Gigi wax! Yes, it does! It can make it SO painful if you don’t have a good wax! You make this look so easy! I’ve considered trying waxing at home, but the thought of it kind of gives me the jeebies, especially when it’s Brazilian time. Do you find that it hurts more or less when you do it yourself compared to someone else doing it at a salon? Haha, I hear you! It took me a lot of pep-talk before I thought I was able to tackle that area! This is a great tutorial! I have had a brazillian done in a spa before (ouch), but have never tried waxing at home! I may have to try hard wax and do my legs for shorts weather! I have played with hard wax in school enough to know that this is out of my league! lol, it takes some practice! I didn’t know about different kinds of wax (went in for laser a few times then got a home device)! Thanks for such an informative post. Hard wax is defo more convenient – no faffing about with cloth or strips. I just recently got a laser device to use at home and want to use it on my legs. It would be nice not to have to shave or wax as much! Sorry for asking two years after this comment, but I am curious. What device did you end up getting, and have you had positive results with it? I am asking because I believe I’d do better with that type of removal with my sensitive skin. My husband is going to help me try hard wax on my leg today, just a test patch. I find I need someone else to rip it off for me, and he had much better results than I did with removing my hair with sugaring. He could get all of it in one go for me. I have not tried hard wax because at some point using soft wax just became increasingly more painful. I’m not certain why that happened, but it just became too painful after years of doing it. Hey, no worries about the time delay! I actually have NOT done the at home lazer hair removal. Mainly because I have been pregnant or nursing for the past 3 years and they recommend not using it when doing that. 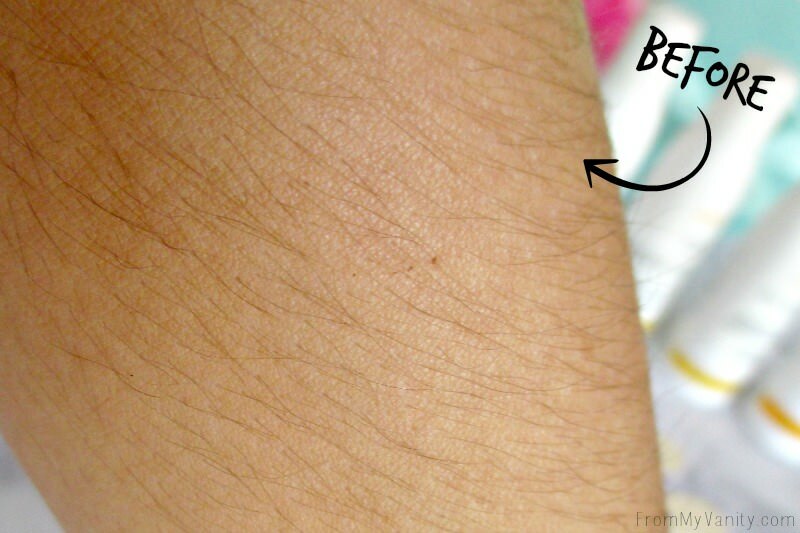 So I haven’t touched my lazer hair removal since then…but with that said, I’ve been contemplating getting an epilator. Yikes…but I hear once you do it a couple times, the upkeep is easy and almost painless. If I do, I will definitely write a post — and probably do a video on my Youtube channel! Oh thank you! Congrats on the additions to your family! Do not blink or you will open your eyes and your youngest will be getting married. It goes by so fast! I used the Epilady when I was in my teens. I was one of the unlucky individuals who would bleed all over and just be swollen from it. My mother used one for years and never had a problem. Since you are already waxing it should be far easier on your skin than it was mine. I had only used a razor before trying the Epilady. I will watch for videos and posts. Have a great week and weekend! I’ve never tried anything like this but for now I’ll stick with razors! This was such an informative tutorial! I never even knew there was such a thing as hard vs. soft wax. I’ve only gotten waxed once and it was for my eyebrows. What a disaster! I was in 8th grade and the technician made the wax so hot that I was applying Neosporin to the burns under/between my eyebrows for days. Nowadays I just stick to shaving and tweezing. I like the idea of having control over it yourself. I should try this! Thanks! Oh my goodness, what a nightmare! That is the perk of doing waxing yourself — you’re always careful not to get it too hot! Hope you find this post helpful if you decide to give it a try! So neat, I’m too scared to wax! I have only ever had soft wax done and the bruising it leaves on my legs, especially thighs, is crazy. I may try this. How long after you wax will the hair reappear?? Great review, thanks for sharing! 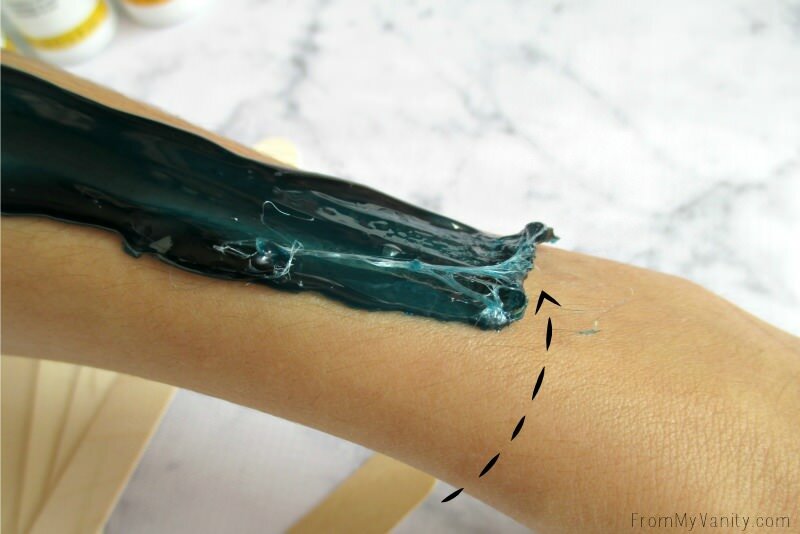 I’ve been waxing my own eyebrows for 10+ years and am only now getting around to DIY arm waxing, eek! I’ve used Avon’s skin so soft to help remove left over wax which has been the most effective removal trick over GiGi’s wax off product. Thanks for the tip! I used to use Avon’s SSS a few years ago, I’ll have to make an order some day and give it a try. Excess wax can be a tricky thing to remove! I have been waxing for many years now.. Always used soft wax. Sometimes i get it done at a salon and sometimes i do it myself. At home i have always made my own wax. There is only one time i decided to buy and bought hard wax instead of soft. Let me tell you hard wax is in my opinion the worst thing that can be used for hair removal. Stuff is messy, time consuming and hard to come off. Whatever surface it touches turns yucky as it sticks and becomes a nightmare to clean. No amount of wax remover will help .. Either skin or surface. A BIG NO TO HARD WAX. Can i use hard wax on upper lip and in face? I have thick black hair type. Sugar wax dont work on my upper lip. I now use soft wax on upper lip, and it not the best. Getting ready to try waxing for the first time-just a little nervous, lol. How often do you do waxing? Do you have to let the hair all grow back out before doing it again? How did it go, Tari?? I hope it went okay! It depends on the area I am waxing. For anything around the bikini area I do every 3 weeks, 4 at the most. Arms I do maybe every 2 months. I don’t mind arm hair, and typically let it grow back in a good bit before I wax it all off. 🙂 I haven’t tried waxing my legs or under arms yet, so not sure about them. Hope that helps! What do you recomend for eyebrow area? My aunt asked me to help her with her eyebrows, and I’m doing some research into waxing and threading and I don’t really know what is the best option. Yes, I would definitely recommend using some type of ingrown hair serum or toner on a regular basis after waxing, as well as make sure you are exfoliating your skin in the shower every 2-3 days. 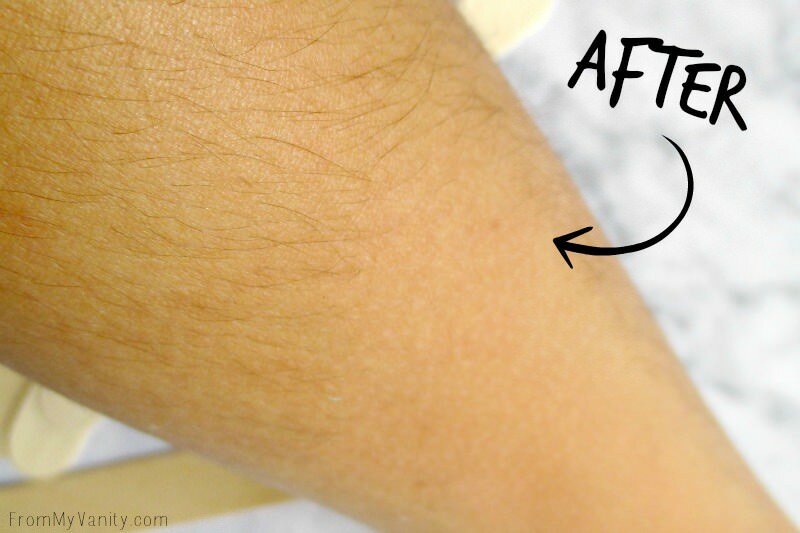 Doing those two on a regular basis really helps keep the ingrown hairs down. Not that these are my “holy grail” or the only ones that work, but the ingrown hair serum I’ve been using for a while is GiGis No Bumps — http://amzn.to/2vmQ49j — and the body scrub I use to exfoliate is Tree Hut’s Sugar Body Scrub — http://amzn.to/2hJULXp — this scent/type specifically is my favorite because it smells AMAZING!! Even though I do these two things routinely, I still get ingrown hairs occasionally, but really only in my bikini area. I also wax my arms and face, but never have issues with ingrowns there. I think the bikini area is just a tough area to keep the ingrown hairs at bay because the hair is so much thicker/coarser than the other places I wax. But doing the exfoliating and toner has made a huge improvement for me. Thanks for explaning the difference. I found it very useful and I want to use this hard wax. Can you please tell me from where l would get this. I got the wax warmer from my local Sallys Beauty and the hard wax I use you can get off of Amazon — they’re both linked above! Oh! The wax warmer I bought from Sallys I do know you can get off of Amazon as well! A professional recommended to me using some oil (I use olive) on a cotton ball to remove the left behind wax. She said saturate the cotton ball and rub it in all over the skin and it will get the wax off. That’s what I do and it works for me! Oh! That’s a great idea! I will have to try that next time — I usually just hop in the shower after I wax, but it still takes some work, haha! I will definitely use oil next time! I’ve waxed in a salon once, a Brazilian, and it was painful! However I loved the results and told it gets easier so I’m definitely doing it again! Just wondering if you have tried the Gigi’s numbing spray or if you’ve heard good feedback that it works? Yes, it gets easier — especially if you don’t wait too long between waxes 😉 And the results are so nice — so much nicer and easier than shaving! I have not tried the Gigi numbing spray — I definitely want to get it and try it soon. The one I use right now is this product (http://amzn.to/2wQa96P) and I’ve definitely been appreciating it’s numbing abilities! Doesn’t make it totally painless, so it’s not that strong. But it takes the edge off, especially in the most sensitive areas. Thank you for the tutorial. It is well done. I have very thick, course curly hair so I have had to use hard wax on my face for years. I have tried occasionally to do my legs but end up with a patch work quilt look. I usually put on more that one strip letting the first cool a bit while applying the second then removing the first, to avoid missing patches of hair is there a secret to how many strips to spread, and how far apart or a lay out pattern? How do you clean the wax pot after? Do you have to empty the wax or is it okay to leave it in there until next time? Thanks! How do you make sure the hard wax isn’t too hot before you apply? I keep burning myself trying to use hard wax lol. Or I’ll let it cool to much amd it’ll harden on the stick thing. Do you have a wax warmer? Or do you just warm it in the microwave? I use a wax warmer from GiGi. It works for now, though. one day I would like to update it with a nicer one. With the GiGi one I put it on the lowest setting and it’s still a bit too warm for my more sensitive areas. What I do, when it’s too hot, is twirl the wax on the wooden stick for a few seconds. It lets the wax cool down a bit. When it starts to move slower on the stick, then apply the wax. It sounds weird, but you’ll get it when you go to do it. When you initially take the wax out of the pot and it’s too warm, it will want to just run right back into the pot. So pick it with the stick and twirl quickly until it starts to cool down and thicken a bit. Hope that helps! I just bought my Gigi wax warmer, but it’s taking me like almost two hours to fully heat the full container? There’s a big blob of wax in the middle that’s having a hard time melting… tips? It can take a while to full melt your wax, and that’s okay. 🙂 You want it to melt slowly so that the wax isn’t too hot and burn you when you go to use it! As for the blob, that’s totally okay, too. 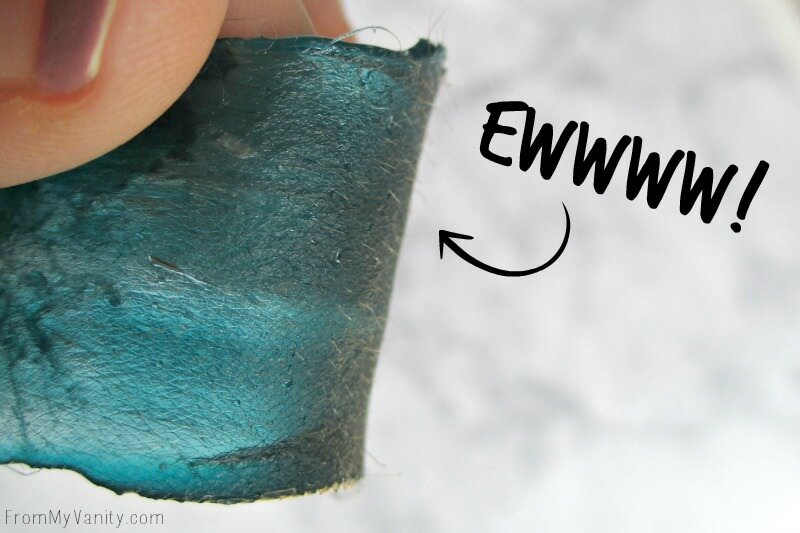 As you continue to keep your warmer on while waxing, you’ll probably notice that it melts away entirely. 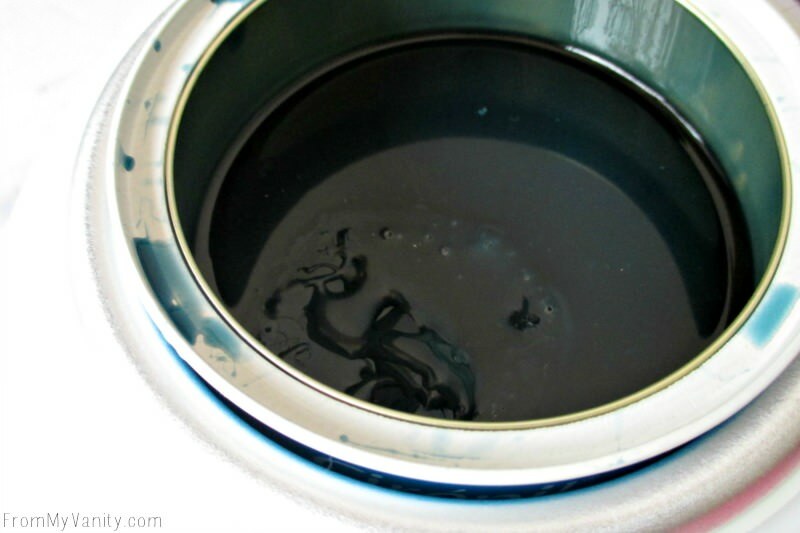 The blob is just a bit of firmer wax in your warmer that is hard to melt because it’s at the very center of your pot and you aren’t using extreme heat (don’t want it to burn) so it will take the longest to melt. Just give the container a little stir every time you dip your wooden stick in to get some wax and, as I said, it’ll probably all melt away. Love this article very informative. I have a couple questions. I’m in Canada. so was looking into the gigi brands you were using, I find that either they don’t have the specific product ie the cleanser or the want way more then I’m willing to pay (179.00 for 8 oz.im looking at you amazon). Do you have any other brands you recommend . Or is there any ingredient specific I should looking for? Is it just a cleanser you are looking for? I would say any cleanser from a brand that sells it for pre-wax treatment should be fine. Here’s one, for example –> http://amzn.to/2IBpuiV <-- I've tried this brand before and really like it! Only thing I want to add is witch Hazel makes a very good wax remover, hair conditioner, AND helps with redness 🙂 Thank you for the advice given! I am still practicing with hard wax some. Im new to it. Oh, good tip, I have never tried that! Cool! Thank you for sharing! <3 Keep practicing, girl, you'll get the hang of it soon! This is a great post! I have used those pre-made wax strips that you just warm between your hands for my upper lip and legs. And they irritate my skin so badly! Little whiteheads on my face and total swollen redness on my legs. I noticed that when I go to the salon and they use the blue hard wax it’s not as painful or irritated afterward. So today I bit the bullet and ordered the warmer and wax off amazon! Do you think two canisters of the wax is enough for both legs? I have a lot of hair (lucky Italian lol) so I’d pretty much be waxing every inch from ankle to upper thigh. Hey Niki! Yes, I do use a type of toner that is supposed to help prevent ingrowns. When I remember to use it (lol) I do see improvement! 🙂 I’ve been using this one the longest — https://amzn.to/2HXTjdy. As for cleansing and keeping bacteria infections away, what I’ve been doing seems to be working. I’ve never gotten any sort of infection or anything like that, and I just use this cleanser beforehand — https://amzn.to/2Hlp2nL — and then I typically take a shower right after waxing. So in my eyes I’m cleansing it again. I’ll also typically follow up cleaning the area with a gentle toner. The one I use is this one — https://amzn.to/2qUPQ7e. And then after that I put a lotion on the waxed area as my final step. I typically use one that’s meant to be used after waxing and supposed to help slow regrowth, like this one — https://amzn.to/2vH3PDo. I hope this all helps you! I’ve added all these to my Amazon Influencer page, which you can find here –> https://amzn.to/2HVVsXd. Thanks for this great info! I’m new to waxing and curious how many hard wax beans you need to wax your legs? How many waxings will one bag cover? Just an estimate, if you have one 🙂 thank you! Hmmm, I’ve honestly never waxed my legs. But I routinely wax my face, arms, and bikini area and can typically do that 3-4 times before I need to purchase a new bag. I would think you’d only need one the first time, and you should get a feel for how often you’d need to repurchase. One thing I will say — the first few times you wax you’ll probably use up more wax than typically as you get used to applying it. The more efficiently and quickly you can apply the wax, the less you use, so the farther it’ll stretch. Hope that makes sense! 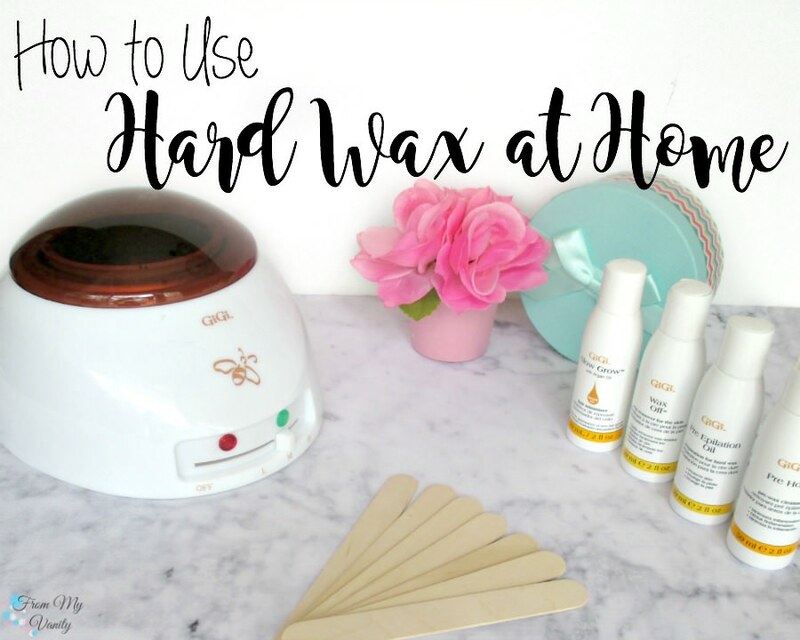 I’ve tried both soft and hard wax I MUST say there is a huge difference for me! First off with the hard wax it was so uncomfortable for me, you can literally feel your skin pulling and she MISSED some spot and from what I’m now understanding it’s basically because you can’t go over the same spot twice! Hard wax was so much bearable and soo much more smoother I’m in love with the aftermath! Can i keep leftover wax in the warmer and use it at a later date? What did you do or can you do with the wax after you use it. Is there a way to clean it up and reuse? Once you remove it it hardens back up and is full of hair. So I can’t imagine any way that you can reuse it. I just throw it away. For your bikini area, I have a suggestion for you. Unless you’re a contortionist and have three hands, it’s practically impossible to do a full Brazilian at home I find, so I just do the regular style, and I prefer hard wax for this. Since you have to kind of overlap onto a hairless area (which is again difficult unless doing a full Brazilian) when using hard wax, in order to avoid “picking”, you can apply it AGAINST hair growth and grab it from the top instead of the bottom. It actually works better for short or coarse hairs. No more picking in hair or gluing the curtains shut. That’s a great tip! Yes, some days I do feel like a contortionist when waxing those areas, lol! !